These pestiferous little buggars are cute and cuddly, I'll grant you that. One website fondly describes pack rats as "sleek, soft-furred animals with big, bright, bulging black eyes." And in another place and time (like maybe a long time ago in another galaxy far, far away), one might think they'd make good pets. But in this place in time, they are magnificent pests. They multiply like, well, rats, move in everywhere you don't want them, and you just can't get rid of them. The packrat lives in your barns and cars, under your porches and your house, in your house if he can find a way in it. They steal things for their nests and they chew through wiring in your cars. They live in between hay bales and under shower stalls in barns; and wherever they decide to build their nests, they use them for toilets. If they were toilet trainable, they might be acceptable creatures, but they are not and they are not. They just stink. A couple years ago, Connie lost her cell phone one day. I thought I heard it beeping around the silver bullet bus once. A few days later John later opened the battery drawer, found a packrat nest stuffed in there and reached in to clean it out - and scooped out Connie's cell phone. No word yet on any suspicious charges on her phone bill. One redeeming feature - if you can call it that - of the pack rat, is their "midden", a debris and waste pile. Pack rat urine is viscous, and once the sugars crystalize, the remaining fluid, known as amberat, eventually hardens and cements the material together. This can preserve the materials in the midden for tens of thousands of years. Scientists carbon date middens and analyze them to determine what vegetation was growing at the time they were created, and with this information, climate change over thousands of years can be determined (Take that, say the pack rats, you climate change deniers! We pack rats have known all along!) The unredeeming feature of the midden is it stinks and it's nasty and it can grow to be huge, either in canyon walls, in barns, under shower stalls, you name it. The 2017 pack rat war has begun. 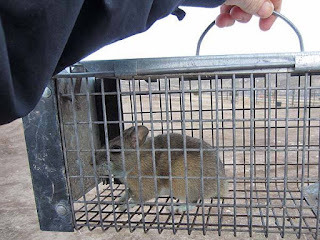 Sorry, dear little pack rats, you have all (once again) been entered into the Packrat Forced Relocation Program (I just can't bring myself to kill them - so I relocate them). Some of you relocated pack rats are being spray painted neon colors as you leave, since I heard from someone they have been documented to travel as much as 5 miles back to where they came from! So all of you pack rats pack some of your things, and BUH-bye.